To be like-minded is to be truly together. How Can I Be Sure? is a helpful tool for assisting any couple to explore one another’s minds and find areas of agreement and a basis for resolving disagreements. This manual will prove a vital tool to any counselor. Now better than ever! 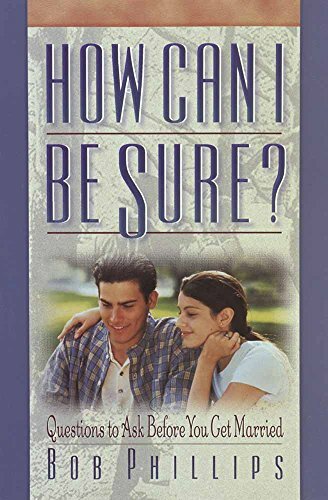 For more than 20 years this proven premarriage guide (over 100,000 sold) has helped couples engage in meaningful discussion about vital marriage issues. Freshly updated to more accurately reflect the concerns of today, this workbook asks couples to respond to insightful questions about everything from their communication patterns to their sexual desires, and from their family histories to their future dreams. Can be used by couples on their own or in conjunction with a counselor. Bob Phillips, master compiler of inspirational verses, Scripture references, and quotes on the lighter, humorous side of life, has written a hundred books with combined sales of more than 11 million copies. Bob also serves as executive director emeritus for Hume Lake Christian Camps and is a licensed family counselor in California.